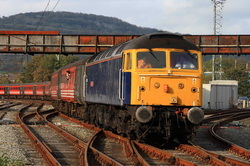 Images will be added to this gallery when time permits. 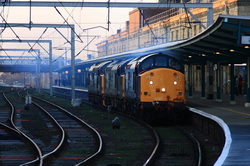 The pair run round the stock prior to departure south. 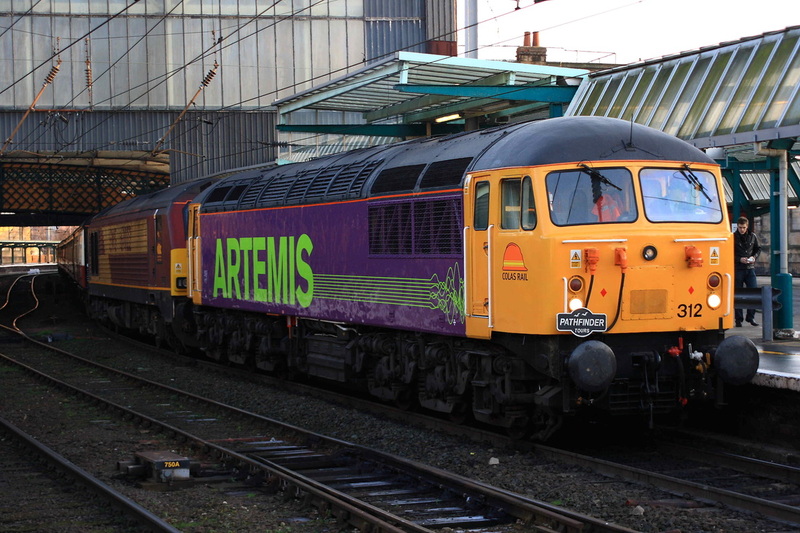 On the rear was 47810, which now wears DRS Compass livery. 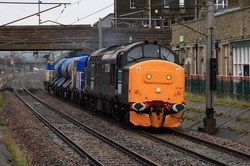 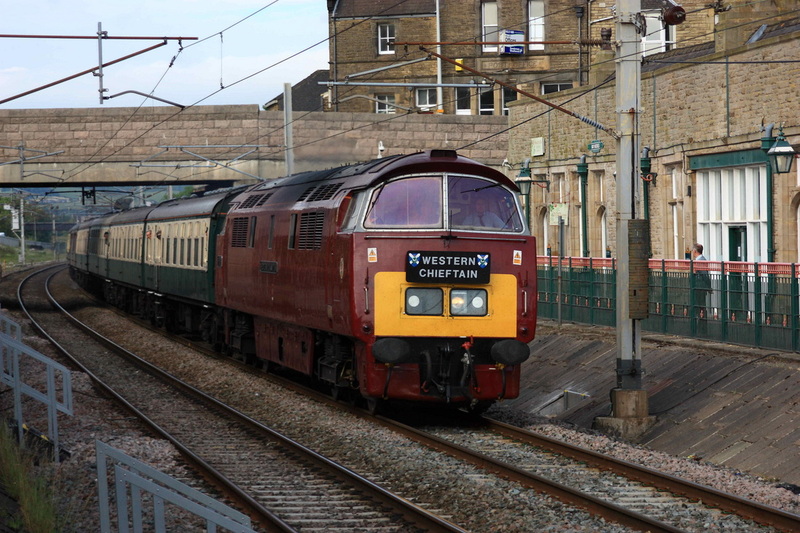 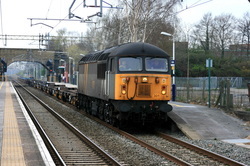 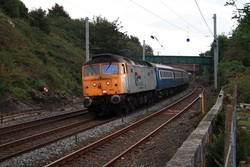 Later on the same day,in West Coast Livery, 37248 "Loch Akraig" works 1Z45 into Bare Lane station. This tour was due to traverse the route to Heysham Harbour, but was capped at Morecambe, dute to NR having issues with trespassers on the Heysham section at the numerous foot crossings. 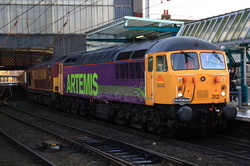 On the rear was 40145. 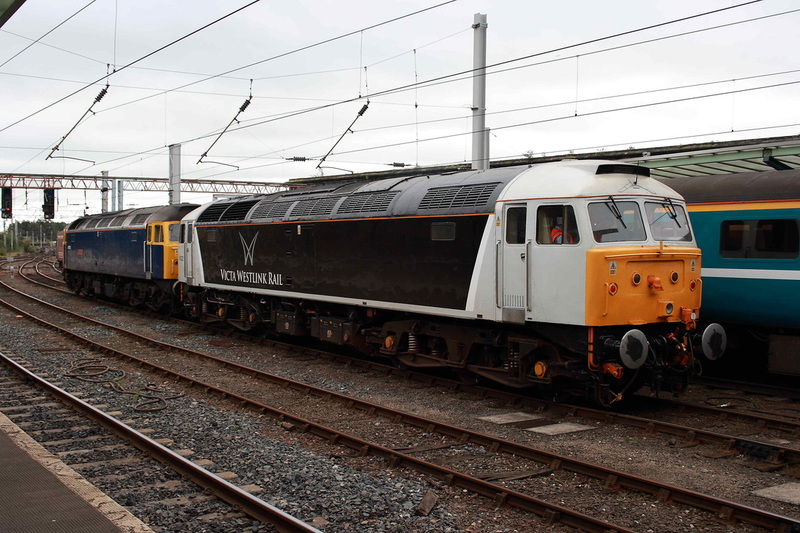 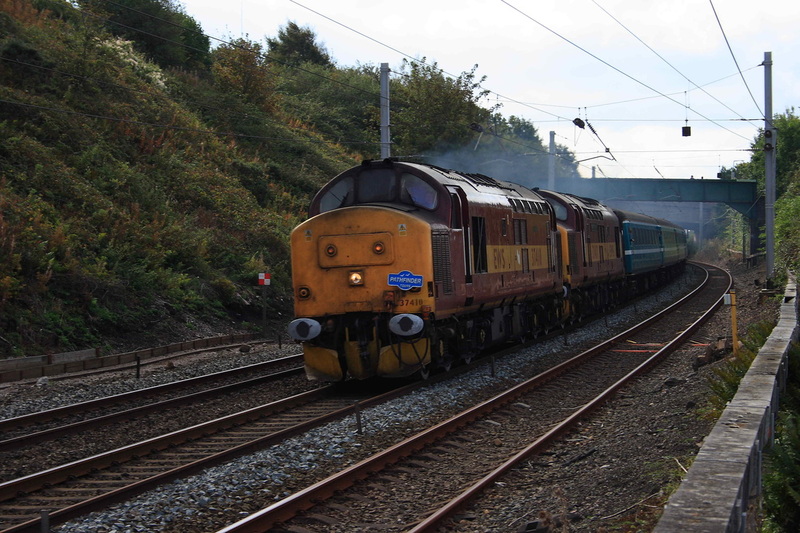 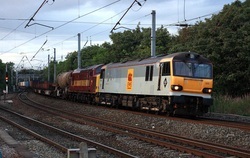 EWS 37417 and 37410 haul 1Z46, a Pathfinder Tour, north to Carlisle on Saturday 29th September, which ran within 10 minutes of the tour hauled by 47818. 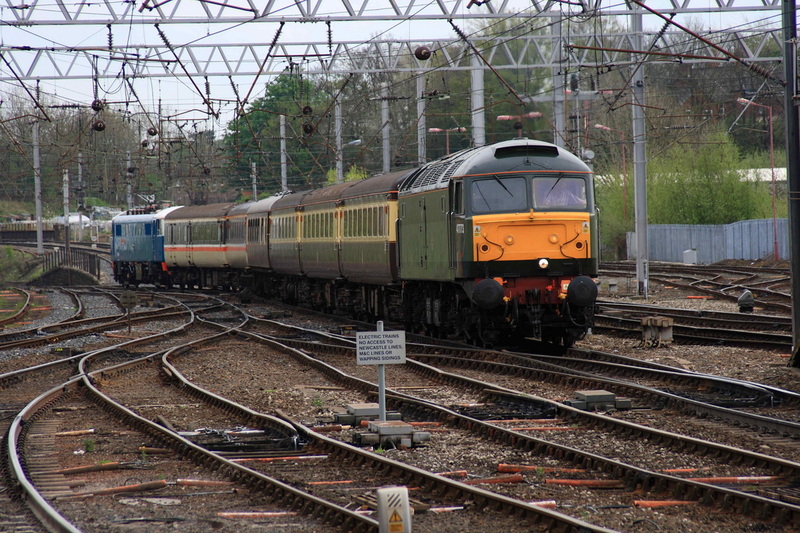 3 locos within 10 minutes, a novelty nowadays at this location. 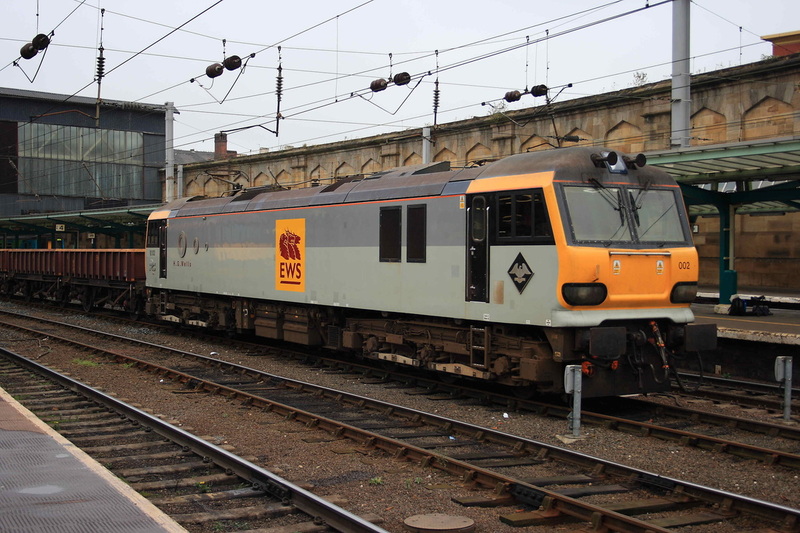 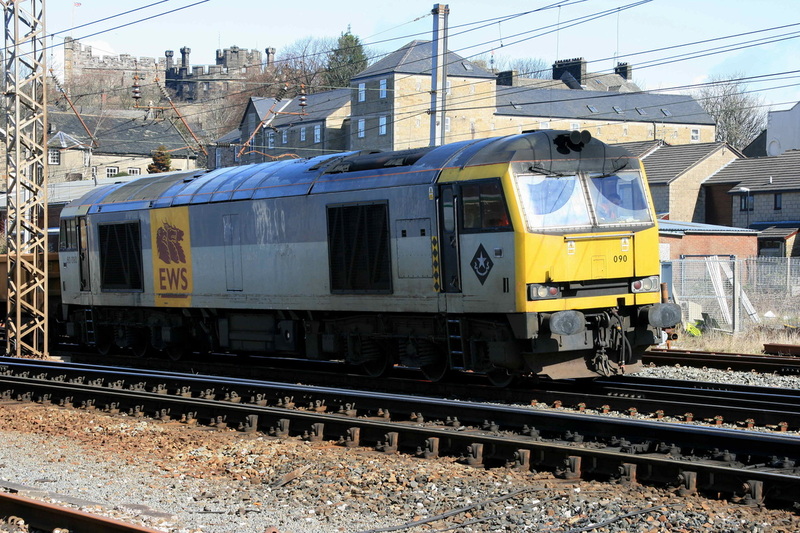 On the same day, EWS 90028 stands at Carlisle, having arrived with 1Z74, a charter service. 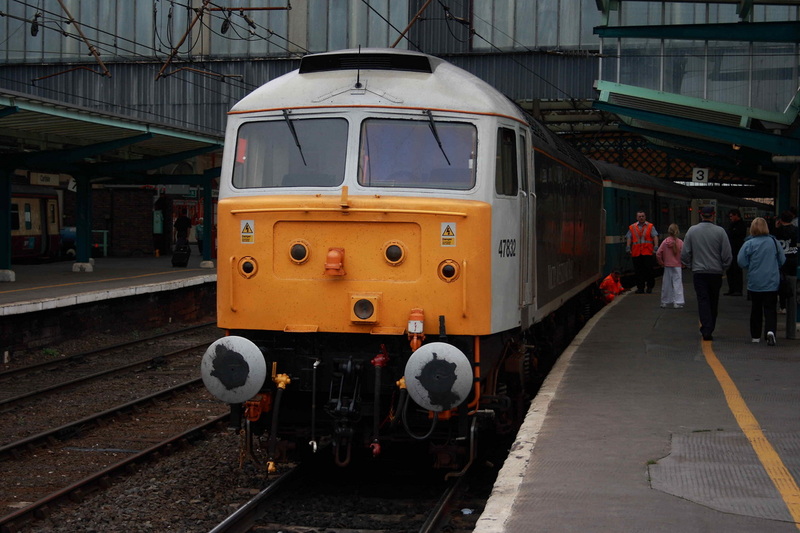 A class 92 loco rarely seen these days, 002 awaits the road south at Carlisle. 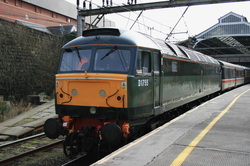 The date was 12/10/2007. 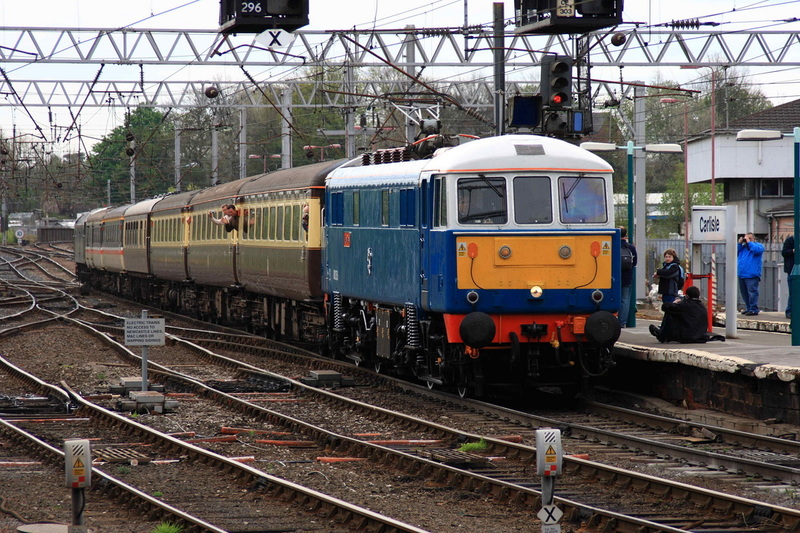 On the same day 47773 arrives at the head of a Birmingham-Preston via Liverpool charter, which marked the return of 86259 "Less Ross" back to the mainline. 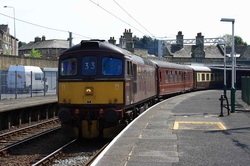 In unbranded Fragonset Black , 31106 arrives at Carnforth with a route learner, which had arrived via the LNWR from Settle Junction on 17/4/2008. 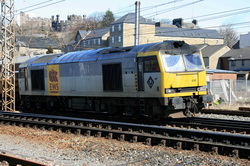 6K05 heads through Carnforth with 60091 on 23/4/2008. 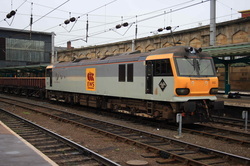 86259 arrives at Carlisle with 1Z57 from Birmingham on 3rd May 2008. 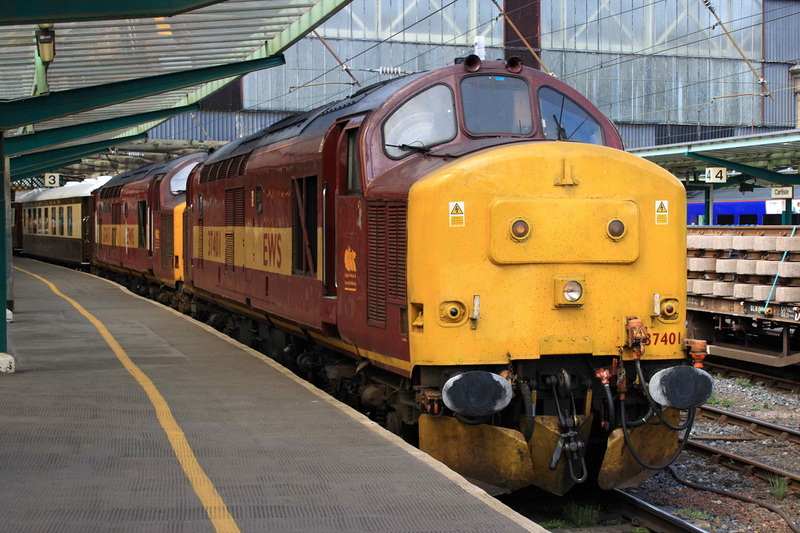 37401/37417 stand at Carlisle on Bank Holiday Monday 5/5/2008. 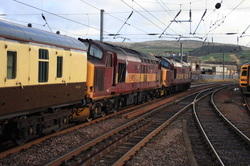 They await departure with the return working back to Swindon. 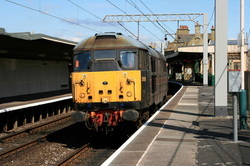 37670 and 37401 head a Pathfinder tour through Carnforth on Saturday 20/6/2008. 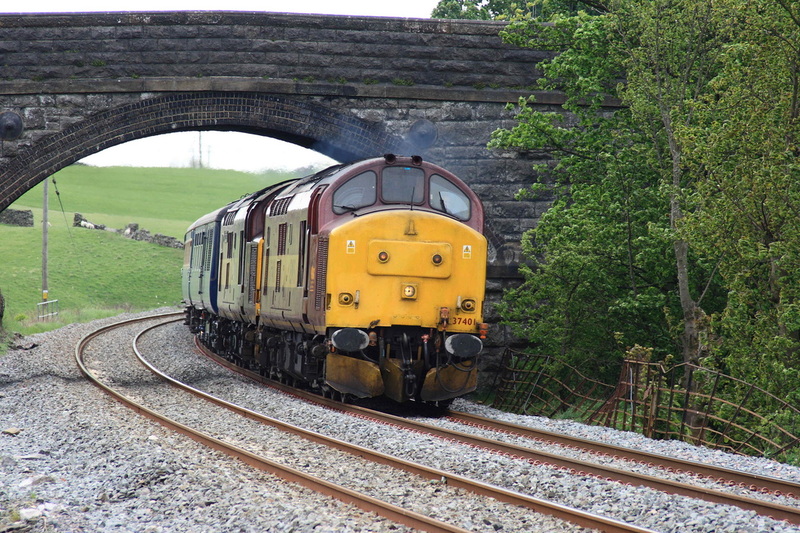 The 37s had been checked on the approach to Carnforth by a Leeds-Morecambe service, and were starting to growl as they accelerated through the station. 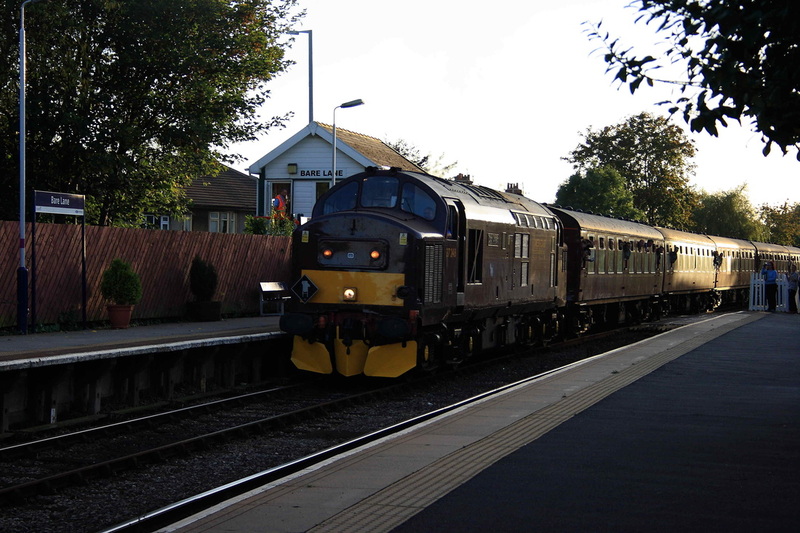 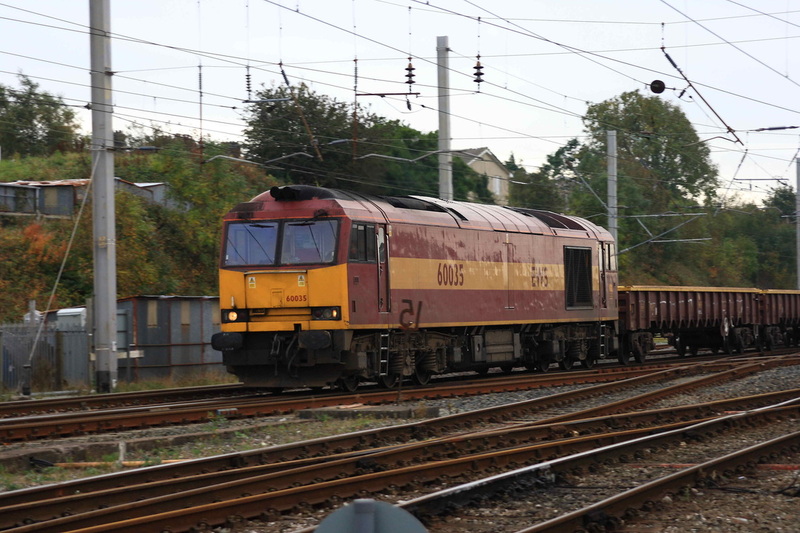 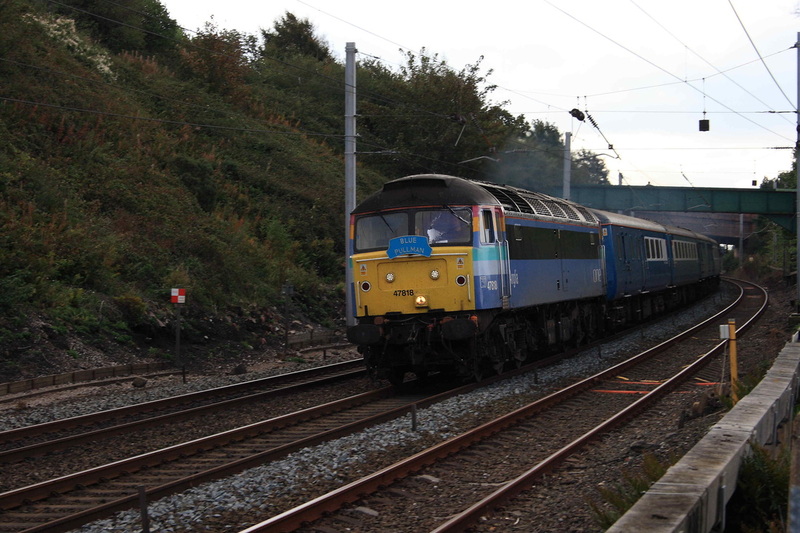 Just for the record, a rather grainy shot of 6O15 heading into Lancaster on 11/9/2008 just before sunset. 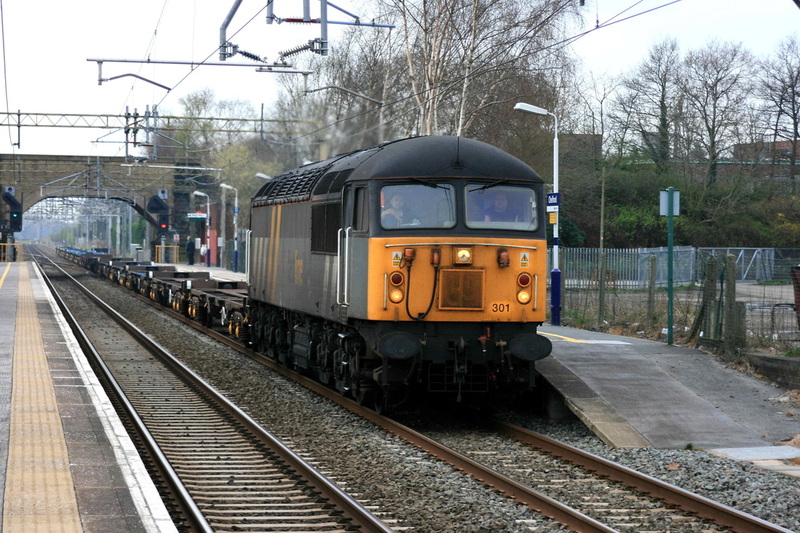 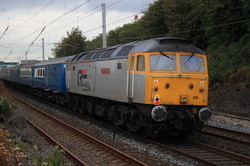 92005 has 37422 dead in train on the Eastleigh Enterprise. EWs 60035 heads through Carnforth with an engineers working on 12/10/2008. The working caught me on the hop, and I only just managed to grab my camera to get this shot. 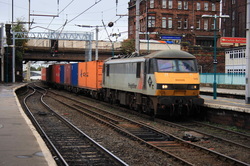 Riviera 47839 "Pegasus" leads an ecs back to Crewe, having stabled at Barrow overnight. 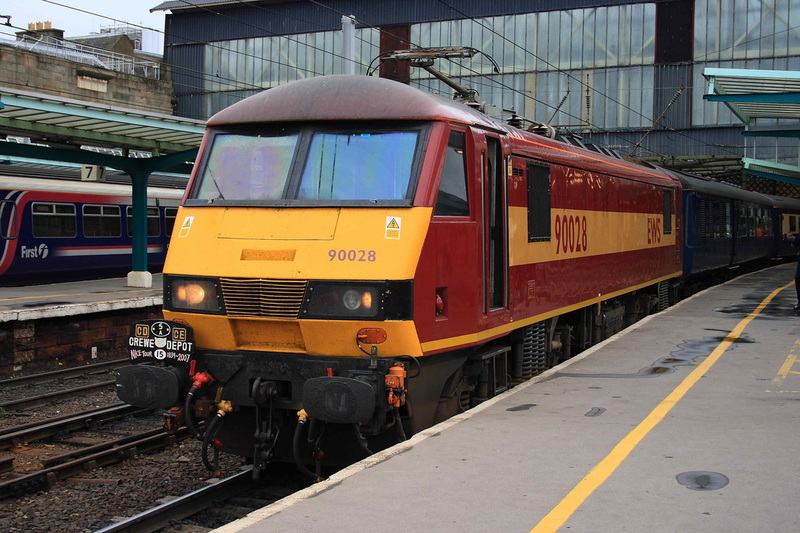 The date was 12/10/2008. 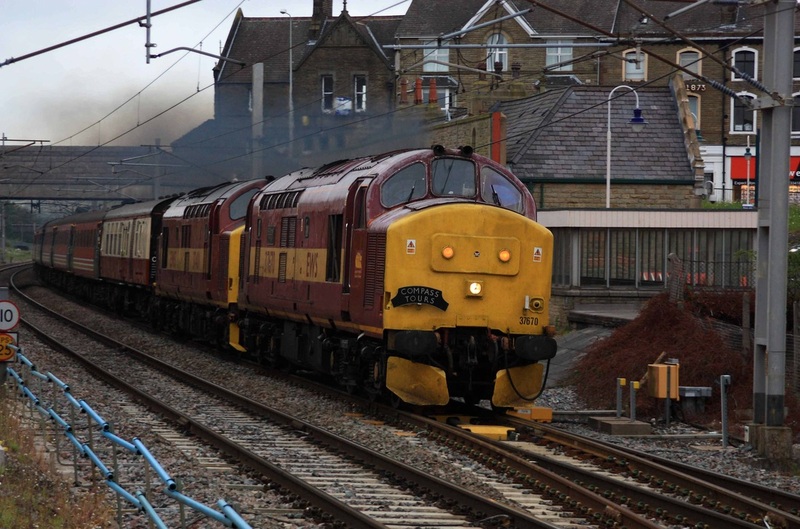 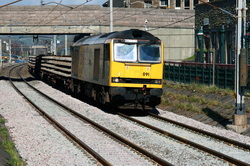 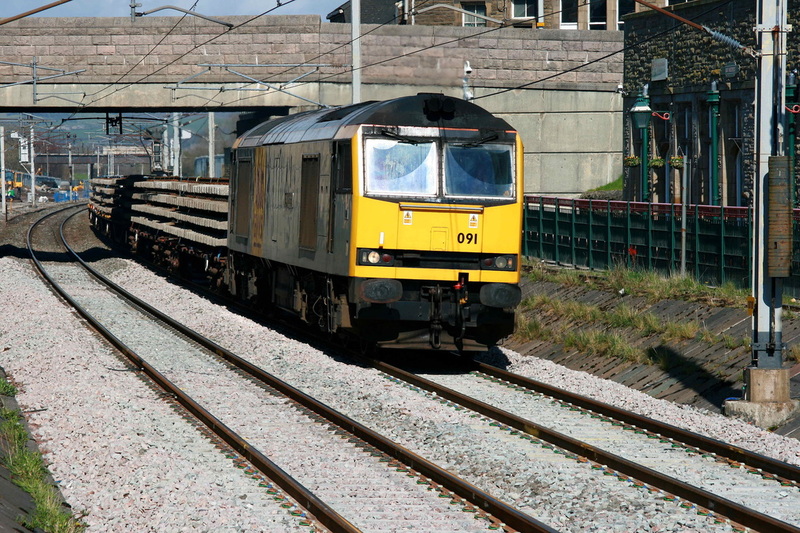 The working is seen snaking into Carnforth station. 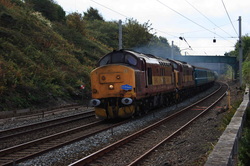 I don't have too many shots of DRS 37261 actually working, but on 19/10/2008 it came through Carnforth with some Water Cannons for a RHTT. 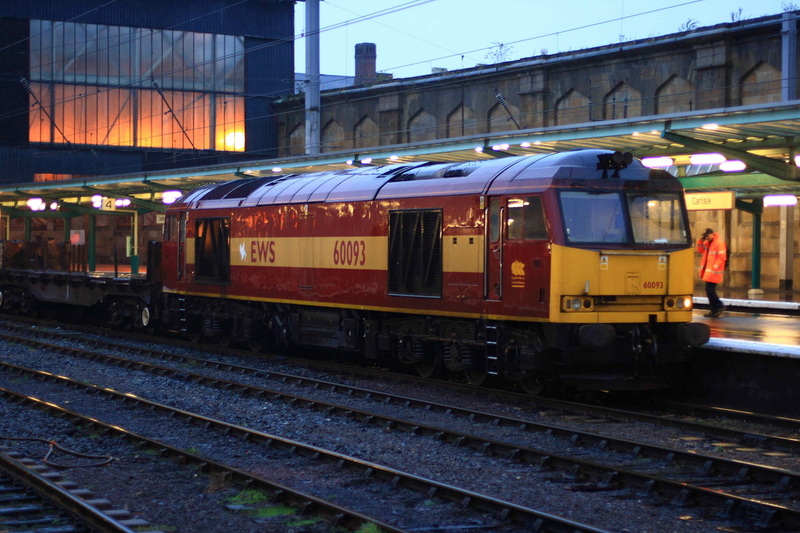 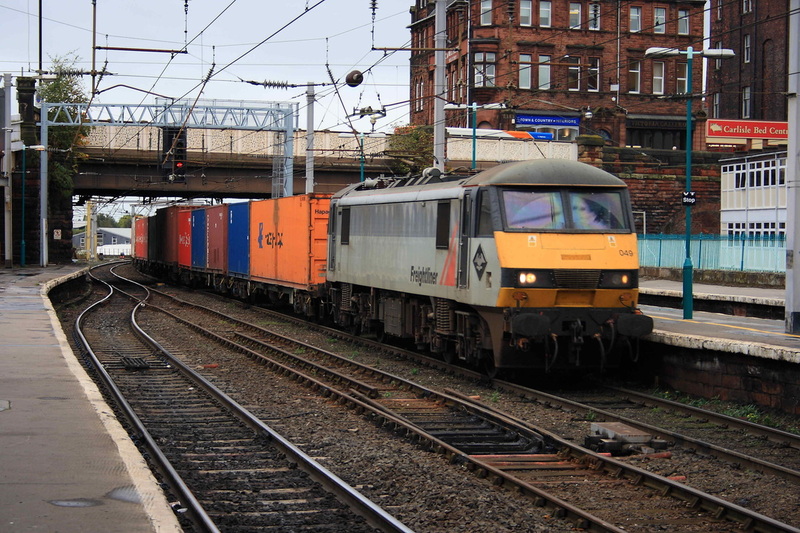 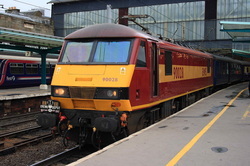 On 29/12/2008, Pathfinder tours ran a charter to Carlisle via the S & C, with Hanson 56312. Here the charter stands at Carlisle. 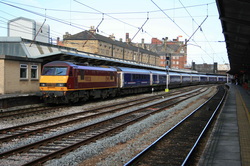 The 56 had 67022 tucked inside for insurance. 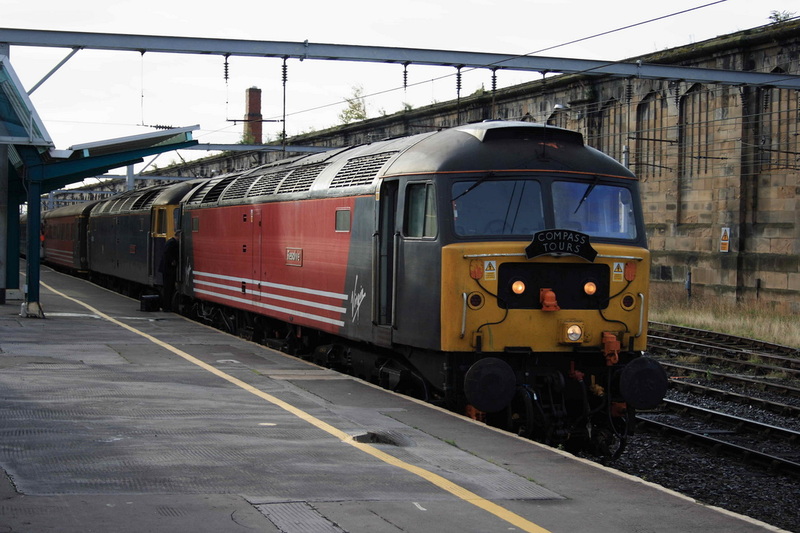 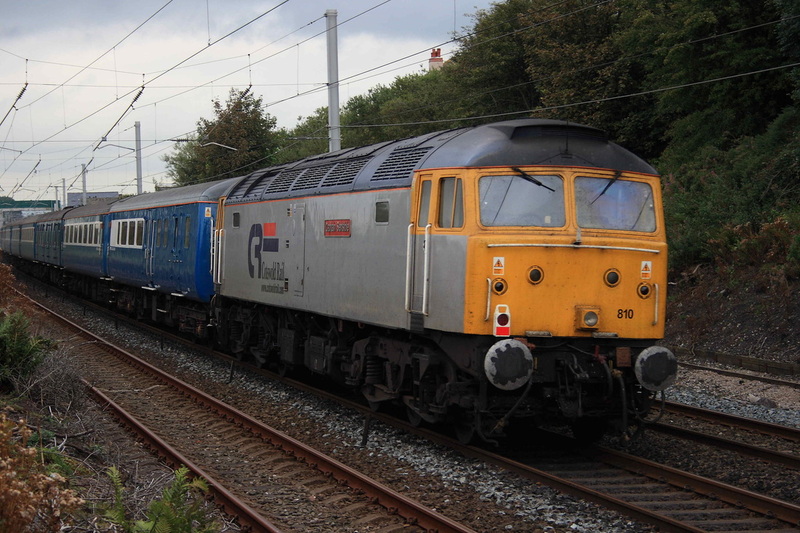 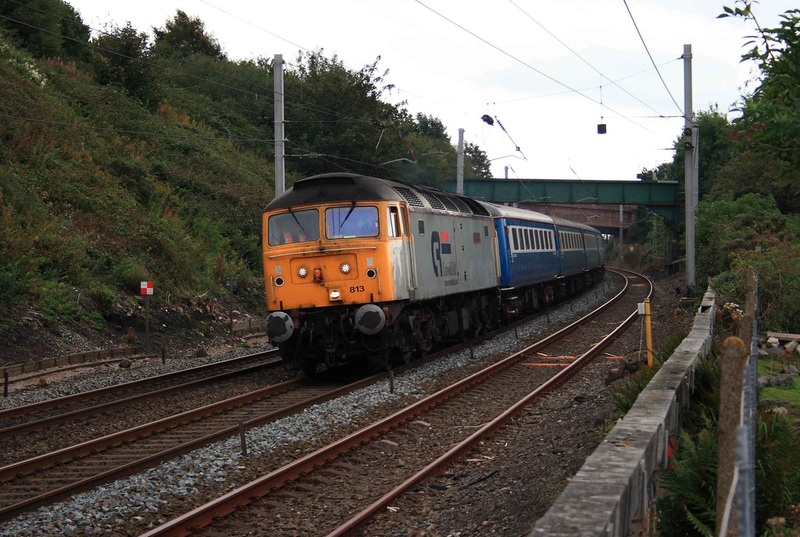 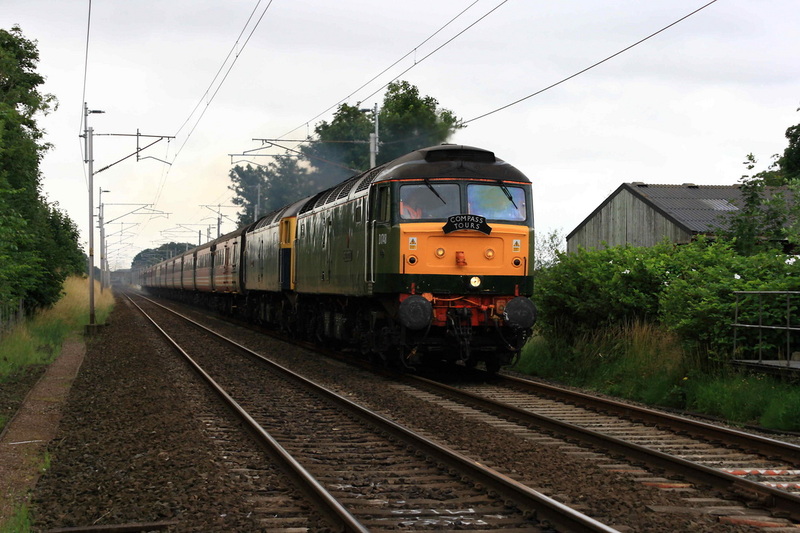 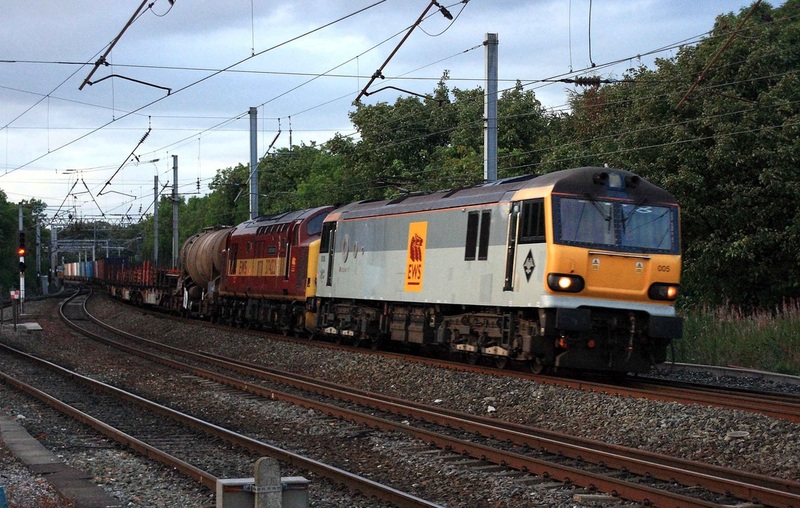 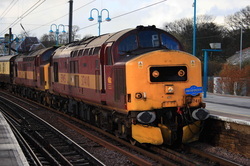 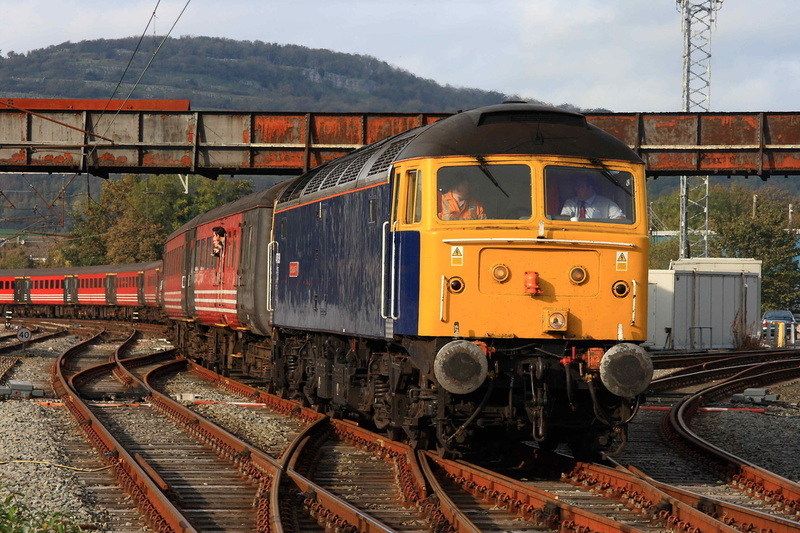 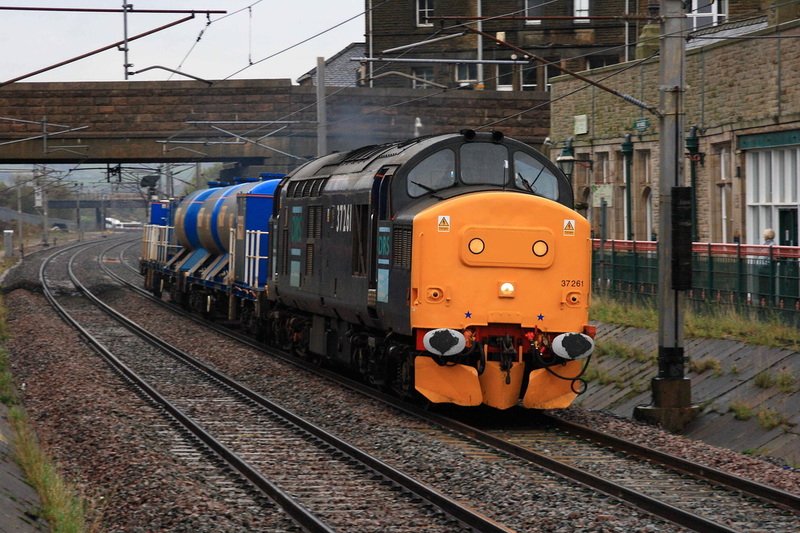 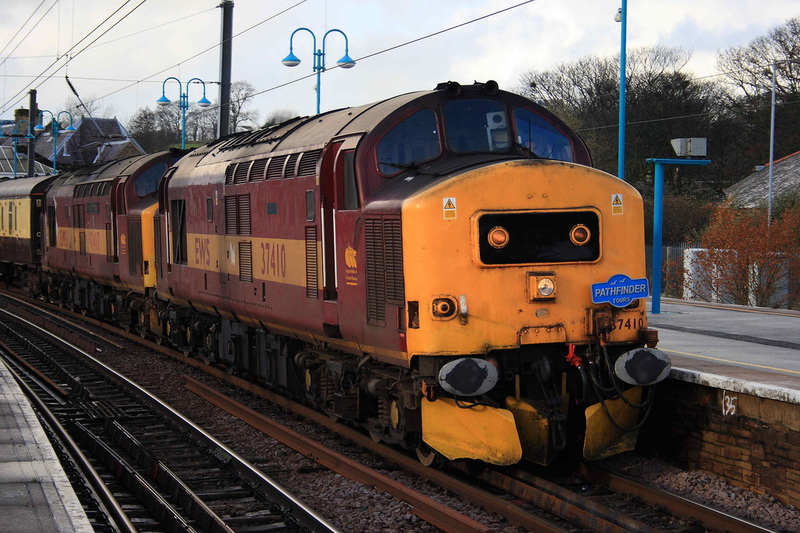 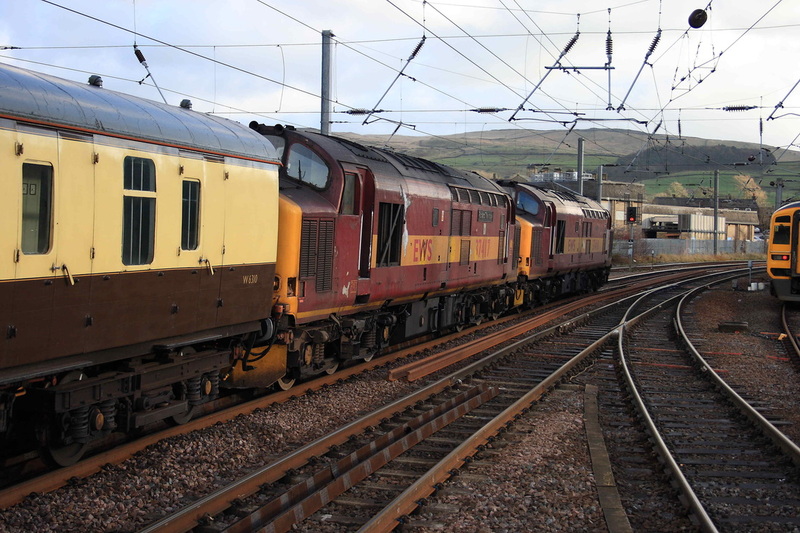 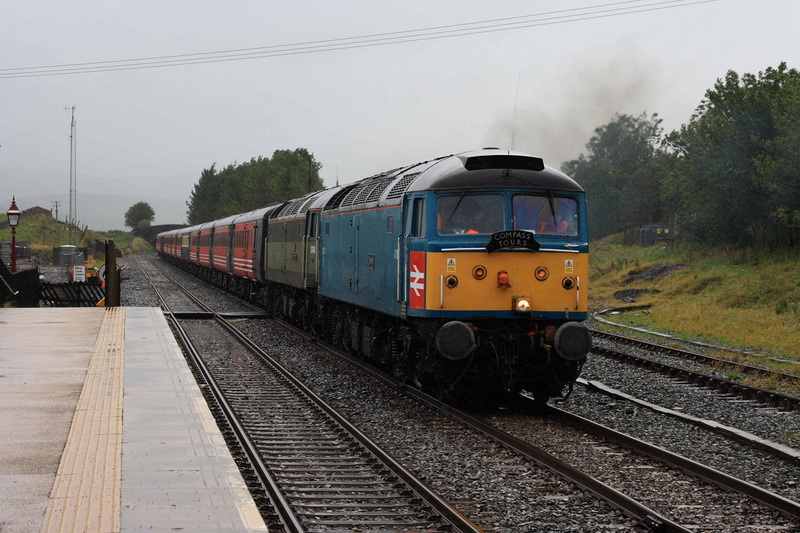 With the approach of sunset, Triple Tractors, 37603, 229 and 688 run through Carlisle presumably heading to Sellafield.